Each year, the Biochemistry department hosts the George Connell Lectures: a series of talks given by an invited researcher from outside the university about the cutting-edge research being done in their labs. We had the opportunity to chat with each of this year’s lecturers about their work and careers. First, a brief history of Connell lectures and their namesake. “Former U of T President George Connell Dead at 84”. I distinctly remember coming across those words within the pages of the Toronto Star nearly three years ago. Like most of the students here in the Biochemistry department at the U of T, I knew that name from the eponymously titled guest lecture series that the department hosts a few times every year. Although that was really the only place where I’d heard his name, the central positioning of that headline and his obituary within the Star made it clear that he was known for much more. 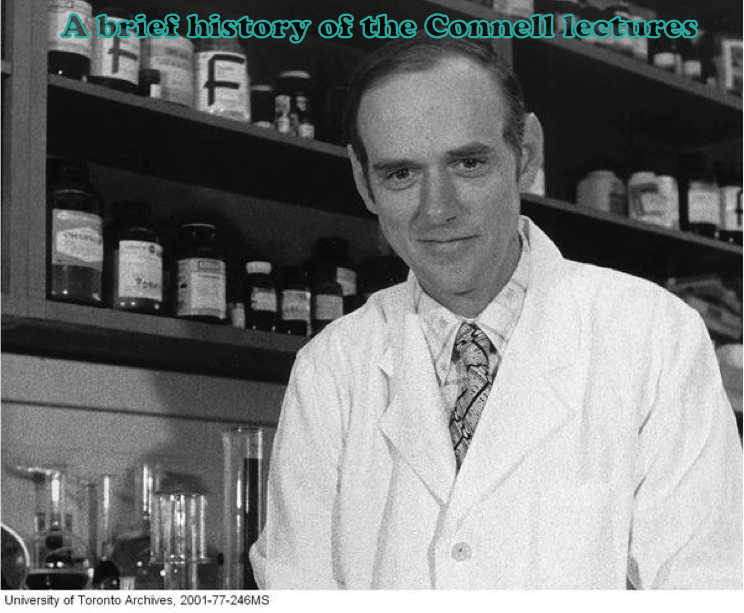 Connell devoted his life to the Biochemistry department and the University of Toronto and the establishment of the lecture series that bears his name served as a final gift to the place that he loved so much. George Connell started at the University of Toronto in the Physiology and Biochemistry program, graduating in 1951 and obtaining his PhD in 1955 (things…were different back then). After a stint as a postdoc with the National Research Council in Ottawa, Connell returned to Toronto as a professor, establishing his own lab in 1957. His work focused on the chemistry of Haptoglobins; serum proteins that bind to free hemoglobin allowing for its degradation. He also helped pioneer a method known as starch electrophoresis, a more appetizing precursor to modern polyacrylamide electrophoresis that uses potato starch as a medium for protein separation. Connell would serve as chair of the Biochemistry department from 1965-1970. Following a tenure as president of the University of Western Ontario, Connell would return to the University of Toronto as its president in 1984 where he would serve until his retirement in 1990. To celebrate his retirement from the presidency, a dinner was held at the Metro Toronto Convention Centre, the proceeds from which totaled over $160,000. As a final ode to the department that he was so attached to, the funds from this retirement dinner were reserved to establish a lectureship series, and thus the Connell lectures were born. Lewis also manages to quell my concern that the initial Connell fund will eventually run dry, putting an end to the lecture series. In 2016, the 25th anniversary of the very first Connell lecture, the department organized a dinner hosted by Globe & Mail health columnist André Picard, part of the goal of which was to fundraise. There are also more long-term plans to seek out an industry partnership: “That’s kind of the long-term thinking, with a sponsor we could even expand to have more than just a lecture series”.